Palm Beach County’s first medical marijuana dispensary is now open for business — the latest sign a budding industry that will serve tens of thousands of people is taking root in South Florida. About 50,000 Floridians have already registered to use medical marijuana since voters approved its use a year ago, and 21 dispensaries have been approved across the state, according to the Florida Department of Health. 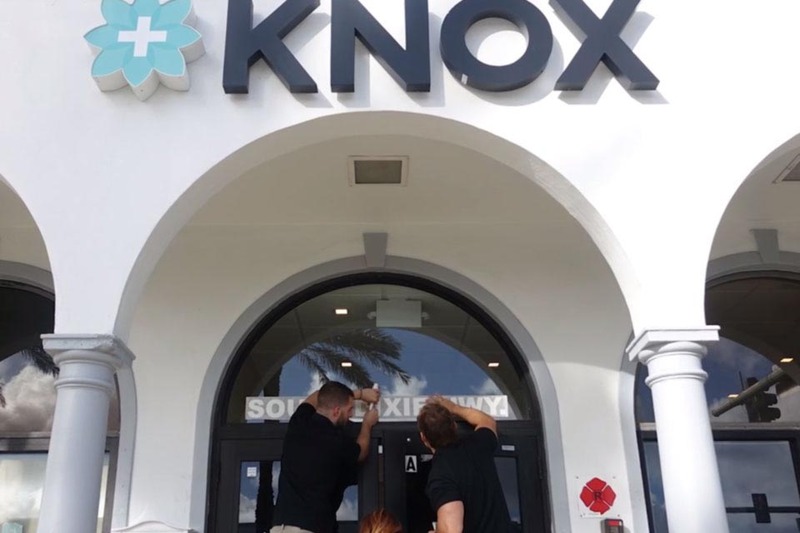 Knox Medical opened the latest dispensary in Florida at noon Tuesday in a former bank building in downtown Lake Worth, making it the first pot shop in South Florida outside Miami-Dade County. City Hall is just across the street, along with the city’s main street filled with restaurants, bars and antique shops. Knox Medical CEO José Javier Hidalgo said the new dispensary will improve access to medical cannabis for everyone in South Florida by providing a shorter drive for patients in Broward and southern Palm Beach counties desperately needing the medicine. The center at 1 South Dixie Highway is open seven days a week. Step inside the medical marijuana center, and the interior resembles a dentist or doctor’s office. Patients must be buzzed into the shop and check in with clerks behind computers in a reception area. Patients with a state-issued medical marijuana ID card can proceed to a room with glass display cases showcasing Knox Medical’s products. Marijuana leaves are absent from the center’s decor, and signs don’t advertise medical marijuana is for sale. Knox Medical went mostly with wood paneling and white walls. An armed security guard is stationed at the business, surveillance cameras are abundant and employees must pass background checks, company officials said. No dispensaries have been approved for Broward County. Three are open in Miami-Dade. Federal law doesn’t allow marijuana to be sent through the mail, but dispensaries offer a courier service for qualified patients. The company delivers the product from the Panhandle to the Florida Keys. Knox Medical offers its products in vials — not from jars of marijuana buds commonly associated with pot dispensaries — to treat serious illnesses, such as cancer, glaucoma or Parkinson’s disease. Florida regulations don’t allow the combustion, or smoking, of any kind of marijuana. Patients can purchase drops that are put under the tongue or cartridges that can be used in a vape pen. Knox Medical also plans to offer topical medicines that can be applied to the skin. Knox Medical grows its marijuana in Winter Garden in Central Florida, Hidalgo said. A vial of 300 milligrams of the medicine costs $45, while 600 milligrams runs about $90. The products are boxed and labeled like any other type of medicine. Dosage is determined by a doctor’s recommendation, and patients can leave with up to a 70-day supply. Both low THC and higher THC varieties are available. THC is the compound that produces a euphoric high and is sought by recreational users. Only a doctor approved by the state can recommend marijuana treatment. Dosage depends on the patient and the condition being treated, said Paula Harrilal, vice president of sales for Knox Medical. While some patients may need four cartridges a month, others might require more or less, she said. Even before the dispensary opened Tuesday, Steve Buchholz, 57, of Lake Worth, was waiting to pick up his supply of medical cannabis. He said he uses medical marijuana to treat chronic pain caused by arthritis in his knee. Previously, he had to go to Miami to purchase medical cannabis. Moratoriums or bans on pot shops passed by seven cities in Broward County make it more difficult to open there, Hidalgo said. Knox Medical wants to do business in a heavily trafficked area with ample parking, a site similar to where a Walgreens or Starbucks would locate, he said. “One of the things that I find ridiculous about moratoriums is the only people suffering from moratoriums are the people who need the medicine,” Hidalgo said. Knox Medical opened its first Florida marijuana retail outlet in Gainesville in May and others in Orlando, Tallahassee, and Jacksonville. With marijuana illegal under federal law, the dispensaries are a cash-only business, but Knox Medical does accept debit cards. Credit cards are not accepted. People who qualify for medical marijuana prescriptions have conditions that include cancer, epilepsy, glaucoma, HIV/AIDS, PTSD, ALS, Crohn's disease, Parkinson's disease, multiple sclerosis or “other debilitating medical conditions of the same kind or class,” according to the amendment approved by voters. The Food and Drug Administration has not approved marijuana as a “safe and effective drug” for any condition, and studies on its efficacy are limited because marijuana has been tightly controlled. Two drugs containing a synthetic version of a substance that is present in the marijuana plant have received FDA approval. Dr. Ahmed Elhaddad, a Palm Beach County physician who can recommend marijuana treatment, said his patients — including some with serious, terminal cancers — have been reporting good results.